From the publisher: Samantha Ryan—homicide detective by choice, witch hunter by necessity—has left Salem for San Francisco, hoping a move will help her forget the horrors of her past. But she’s about to discover that witches tempted by the dark side are everywhere…. Samantha is doing whatever she can to forget her terrible childhood in a coven destroyed by its members’ greed and lust for power. Now she’s a San Francisco detective struggling to fight her own desire to turn to magic. But as she discovers, escaping who you are isn’t easy. Her latest case seems straightforward enough—the murder of a local historian named Winona Lightfoot. But strange clues take Samantha to the Santa Cruz Mountains, a place teeming with witches and black magic. As she works to uncover the connection between Winona and this coven, an earthquake rocks the Bay Area. That’s when Samantha has a premonition: Something is coming. Something evil. To survive—and save everyone around her—she will have to tackle her greatest fear, and hope she isn’t the next one put into a deep, dark grave…. Why did you choose this book? When a Signet Publishing rep offered up this book, I immediately responded with a “Yes, please!” Since I’m a huge fan of Juliet Blackwell’s Witchcraft Mystery series set in San Francisco, this book looked like a surefire win. How could I go wrong with witchcraft, mystery and a touch of romance? Where did the author go right? Or if it’s a turkey, what went wrong? This book is so incredible; I don’t even know where to begin! I guess I could start with Samantha. Despite the whole superhuman thing, I think a lot of readers can relate with her struggle to overcome her past. Anyone who has suffered from an abusive upbringing will emphasize with Samantha’s self-doubt and trust issues. I really fell in love with this character because she desperately wants to be a good person, but ghosts from the past kept dragging her back down the rabbit hole. In addition to an incredibly endearing main character, the author knows how to weave together a tightly-plotted mystery. I felt like I was right there with Samantha as she stumbled upon bizarre clues – like a petrified dead body in the middle of a museum – and came up with more questions than answers. The momentum kept building – leaving me with no other option but to tear through the pages until I knew San Francisco was safe from a ginormous earthquake. I’ll stop right here before I give anything away. But I will say that she’s dealing with one helluva evil witch who’s willing to wipe out an entire city to get what she wants. While I’m at it, I should mention the setting. Like Juliet Blackwell, this author uses the San Francisco backdrop to her advantage. I especially loved her descriptions of the spooky circle of trees amid the backdrop of the Santa Cruz Mountains. Oh and the nighttime rendezvous scene at the Santa Cruz boardwalk totally evoked images of Lost Boys. What is it about carnival rides after dark? There’s something really unsettling about being all alone in an amusement park with the dead eyes of carousel horses staring back at you. Did anything bug you about the book? Oh man, I wish I could offer some constructive criticism, but nope. Just keep doing what you’re doing, Debbie. Would you read another book by this author? Absolutely! I’m listening to the first installment of the Witch Hunt series right now on audio. I just finished the part where Samantha escaped the forces of evil in the house where her mother and her coven of evil witches were found dead in a supposed “mass suicide.” This is some creepy stuff, y’all! How would you sum up the book in three words? Scary, thrilling, addictive. 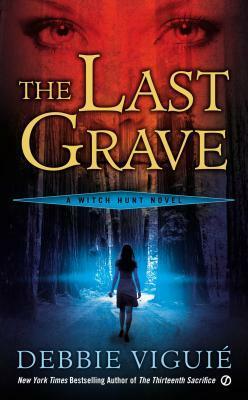 Posted on April 6, 2013 by Bubble Bubble Books and Trouble •	This entry was posted in Adult Paranormal, Mysteries and tagged Debbie Viguie, paranormal mysteries, Witch Hunt mystery, witchcraft mysteries. Bookmark the permalink. Oh my gosh, I love that photo of Gizmo! Thanks, Beth! He likes to ham it up for the camera. 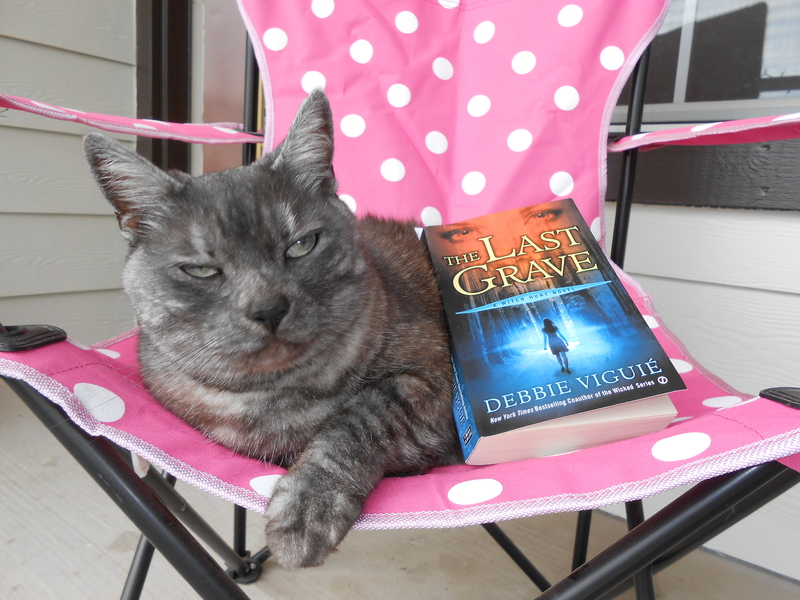 He’s very excited about posing with your new book!